Reportback from the forest walk in Hambacher Forest on Sunday. The cops lost control over the forest for hours as thousands started to build barricades in an act of mass civil disobedience. We had to park our car long before we arrived at Hambacher Forest. Everything was full and many many people were already on their to the starting point of the forest walk. Sunday’s edition of the weekly forest walk was not banned by the cops, like it was last week. Probably they realized that last weeks ban was a disaster for NRW’s state minister of interior, Reul as about 10.000 people ignored the ban and went into the forest anyway. As we arrived at the official starting point, several thousand people were already there and the crowd continued to grow. The first groups didn’t even wait for the official forest walk to start, they went immediately into the forest. They were checked by cops at the entry of the forest, but were allowed to pass after their bags were searched. Last week the cops lost their checkpoint after a few hours, but this week people didn’t even try to put pressure on that checkpoint. People that didn’t want to get checked just went into the forest on other spots. That’s something we didn’t know yet as I made the livestream in the tweet below. People continued to arrive and a comrade that was still on his way, informed us that the next train from Cologne was also packed with people. The weekly forest walk is taking place for 53 months now and started with 50 people. Two weeks ago there were about 7.500 people, last week 10.000 and this Sunday there were even more. The forest walk stayed on the roads but when we marched on RWE’s securoad, cops looked nervous and again and again were watching their backs. No wonder because at Securoad more and more people started to leave the march and went into the forest, where cops soon lost control again. There were many cops in the forest, but they had no chance to control the crowd there. The cops mostly stay on the roads, but many people left the roads and started to reinforce barricades at Paragraph 11, that was evicted one day later (Monday). Still the reinforcement of the barricades on Sunday was important. It delayed yesterdays eviction so much, that the cops could only evict Paragraph 11 yesterday. New occupations like Ghosttown, Black Socks and Qualityland are still there (Tuesday morning). Saying that, we come to the next problem for RWE and the cops. They evict and evict, but every night people start building new tree houses and platforms in Hambacher Forest. While about 1000 people were reinforcing barricades at Paragraph 11, others were building new barricades around Ghosttown. At the roads leading to Ghosttown people were also digging trenches and building new barricades. In the late afternoon the cops wanted to start removing barricades at these roads but were confronted from a determined crowd that started a sitting blockade. The cops announced that they would use force to clear the sitting blockade, but the reaction of the people was to start a second sitting blockade when the cops started to reinforce their occupation troops. Nobody left. Families with children and elderly people were part of the blockade. Many journo’s were also there and the cops seemed to be nervous and didn’t want images of cops using violence against what they would call “ordinary people”. The standoff lasted for hours and during the whole time we heard the sound of people building new barricades behind us and the sound of hammering by people who were building new tree houses and platforms. Behind the sitting blockade many people were standing, others were building. At 06:16pm the cops retreated from the sitting blockade. People cheered and it probably was an important lesson for many people who didn’t have a lot of experience with this kind of standoffs with the cops. Although the cops summoned them to dissolve the blockades about 6 times “or we will use force”, the cops were not able to do what they were threatening to do. Similar like ast week, there were to many determined people. In the early evening hours people were still building barricades, the cops really had a bad day and lost control for hours again. Even when they started to remove first barricades around 09:30pm. The trenches and the amount of new barricades gave them a headache. They also did not remove the new barricades in the forest that night. Only the ones at the roads. 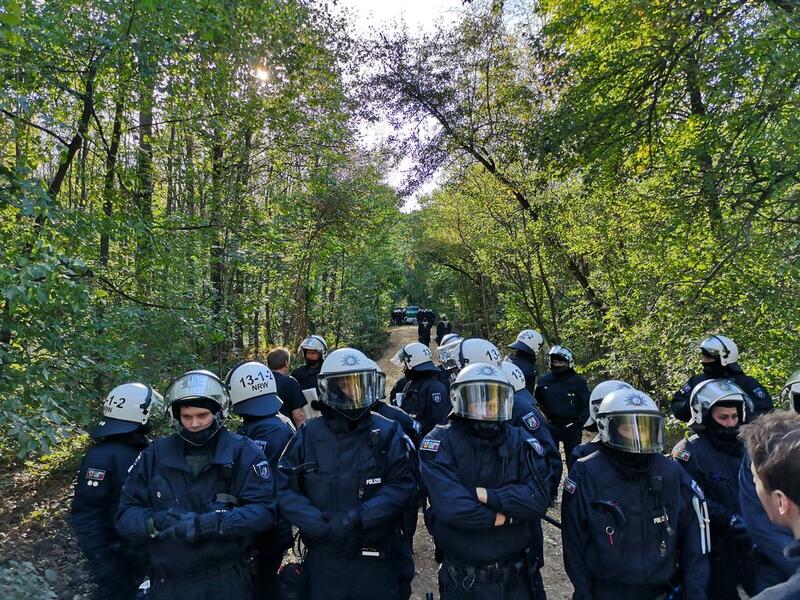 We came out of Hambacher forest without any problems, but later as many people already left, the cops started to check people and gave them a ban for the premises. Randomly. But other people stayed in the forest and were sleeping below Paragraph 11, behind the second ring of barricades. 22:09 We already left #HambacherForest but there are some tweets that people who come out now are being checked and get a ban for the premises from now until tomorrow night 24:00. #HambacherForest #HambiBleibt #HambacherForst Take care use side exits, no roads. As October 14 is coming closer and closer, the resistance keeps growing. On October 14 a court will decide if the stop of cutting the last part of Hambacher forest will be lifted ot not. At the moment there is a huge mobilization for a demo on October 6. On the same day there is a mobilization from Ende Gelaende: the initiative is calling to bring hammocks to the forest.